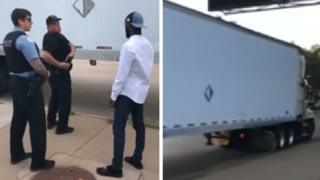 Police in the US city of Chicago say they will “take a hard look” at their use of “bait trucks” to catch thieves following criticism from activists. Video posted on social media last week showed residents confronting police officers about a white unmarked truck. Activists say it was filled with designer shoes and left partially open to entrap groups of young people. But the police say the truck was used to target thieves who had been breaking into freight containers at a rail yard.